I’ve been using an Aracom DRX attenuator in the studio for the past couple of weeks and I have been absolutely blown away by its ability to tame my volume just as well as my now-retired PRX150-Pro. But this past Friday, Jeff delivered my own DRX that I had him build based upon my tests, and I just had to gig with it to try it out in a live-audience situation. I do have to admit that the DRX is a little less convenient than the PRX150-Pro in that I have to hook up a couple of more things: The foot switch and power supply (for the footswitch). But that inconvenience becomes negligible when the DRX is in action! First of all, the boost feature is an absolute god-send! With all other attenuators – and this includes my venerable PRX150-Pro – once you hit the volume limit, that’s it. You can’t go louder. But with the DRX, that’s no longer an issue. It was great to use this feature to boost my volume when I was doing leads and not have to worry if I had hit the limit (or set up my volume so that I stayed under the limit). With the boost feature, which is essentially an attenuation reducer, I can add a few or maybe even several dB of volume with the flick of a switch. It’s absolutely amazing! But it doesn’t stop there. The Variable Dynamic Control, which varies the reactance between the attenuator and speaker, helps dial in my tone so I have the right amount of highs. While not an EQ, the VDC adjusts the reactance and acts like a very subtle high-cut filter. Fully right is full reactance, and as you move through the next four positions, the reactance is slightly reduced, resulting in more highs being cut. 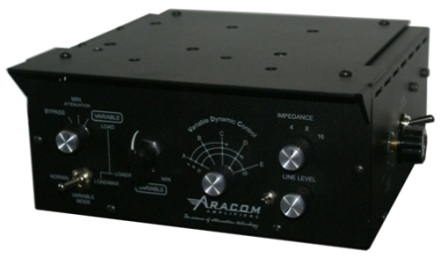 For my particular setup of an R8 Les Paul through my Aracom VRX18, I felt that the sound was just a tad bright, so I went down one position on the VDC, and my world was absolutely right. My tone was still bright and had plenty of bite, but not so bright that it was like icepicks in my ears. For purely clean work, I completely defeated the attenuation, which was possible from the front panel. On previous versions, the bypass was on the back, and in tight spaces, wasn’t practical to reach around. But with it on the front panel, defeating the attenuation is a simple matter of turning a dial. 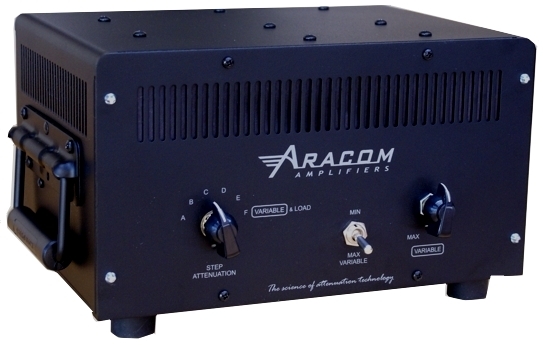 All in all, everything about this attenuator is a huge improvement over earlier generations of attenuators; Aracom and others. It comes at a premium, but we spend thousands upon thousand of dollars on guitars, amps and pedals, so I see no problem justifying the cost of this unit. It makes it possible for me to play an overdriven amp in ANY venue. Yeah, yeah, you can argue all you want that you can do the same with a clean amp and overdrive pedals. But diode or a even tube overdrive pedal will never be the same as the overdrive from a cranked amp. To say I’m happy with this latest acquisition is an understatement. For the last few years, I played the best attenuator on the market. But it pales in comparison to what the DRX brings to the table. The funny thing though is that unlike other gear that makes a sound, this doesn’t produce any sound, so it’s difficult to put into words what it actually can do beyond helping me control my volume. But it controls volume better than anything else on the market, and provides versatility that none other can. 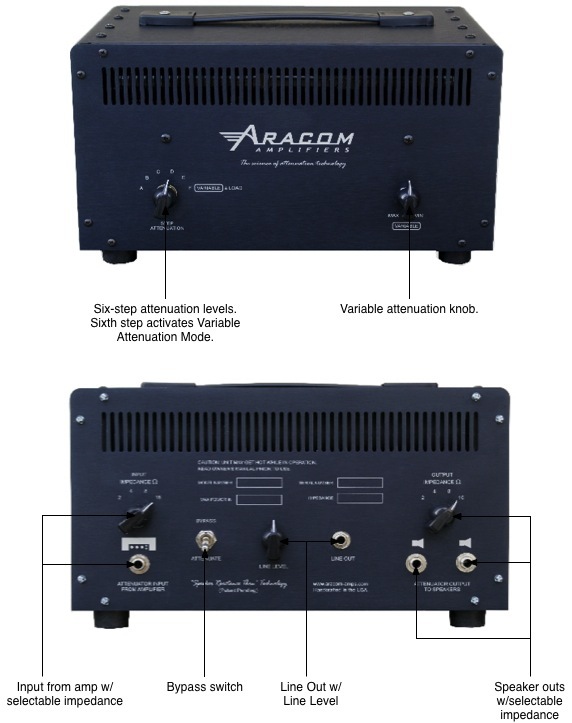 And as far as “transparency” goes, well, arguments abound, but with the Aracom attenuation technology, you can rest assured that the tone and the dynamics that you expect from your gear won’t be lost. I can’t say that about any other attenuator I’ve tested. This is the real deal, folks, and this is the future of attenuation! For more information, check out the DRX product page!